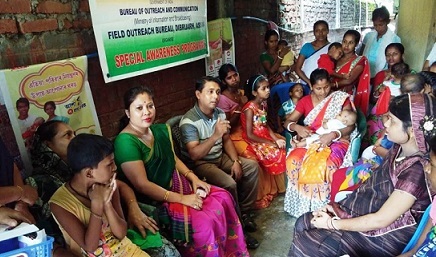 With the theme for this year’s World Population Day — ‘Family Planning is a Human Right’, the Dibrugarh office of the Field Outreach Communication, Union Ministry of Information and Broadcasting on Wednesday organised an intensive awareness programme at Krishnanagar-Basantanagar village under Barbaruah Block Primary Health Centre in Dibrugarh. The programme was organised with a noble initiative of Momi Gogoi, ASHA felicitator along with Anima Konwar, ANM, Aruna Bora, ANM and four other ASHA workers Rumi Konwar, Sanjita Dutta, Deepali Medhi and Anjana Das. Topics on family planning, breastfeeding, birth spacing, how to use condoms and contraceptive pills and on personal hygiene were discussed during the programme and condoms, I-pills, IFA tablets, ORS were distributed to the participants. Pranab Kumar Nath, officer at Field Outreach Bureau, Dibrugarh in his address focused on promoting male engagement and spousal communication. The topics of discussion during the group discussion included importance of family planning, methods of family planning, right age of marriage, importance of population stabilization, inspiring others for male and female sterilization, importance of birth spacing, maternal health, child health and immunization and misconceptions of family planning methods. The target group was lactating mothers and pregnant women with an aim to create awareness and educate them to be and to become healthy mothers and also to enable them to clarify their doubts to improve their health. Momi Gogoi in her address reiterated that family planning has become a very important key for a healthy and happy family.